Luckily dairy was one of the easiest things to replace. To be honest, it is mostly thanks to cashews, a nut that I have seen hanging off of the trees in India, like a pair of earrings that my offbeat grade five teacher would have worn. They don’t look like anything that would ever grow anywhere near where I live, but I do make an allowance at times when creamy is what we’re looking for. I have cut them with sunflower seeds in this recipe; this makes me feel a little bit better about it and will save us some money too (India is a long way away!) You could also use all sunflower seeds, the texture just won’t be as smooth, but it makes a great nut-free dip. A version of this dip is what got me really excited about this alternative/healthy style of cuisine (that and Zucchini Noodles) years ago when I was first learning. Why would you ever buy cream cheese when you could have something like this: filled with ingredients that you should be eating anyway and that’s before you’ve taken into account the veggies that you’re going to dip into it or the collard green you’re going to spread it on to make a delicious wrap. SO AWESOME! I’m into dill these days but if you’re feeling wild, use the nuts/seeds and acids as a base and add the flavours you love to make it your own. I used to go over to my friend’s house in elementary school and her Dad would mix cream cheese with chili peppers and we would eat it with Ritz crackers (and then go jump on her trampoline). It was so simple and good, I still think about it today (obviously). Not surprising, chili peppers also taste great in this. Or sundried tomatoes and basil, or cilantro, lime and jalapeno, or curry powder and black pepper (with some extra turmeric), the sky is the limit! You can also make this in your food processor if you don’t have a blender, just let it go until it gets very smooth. 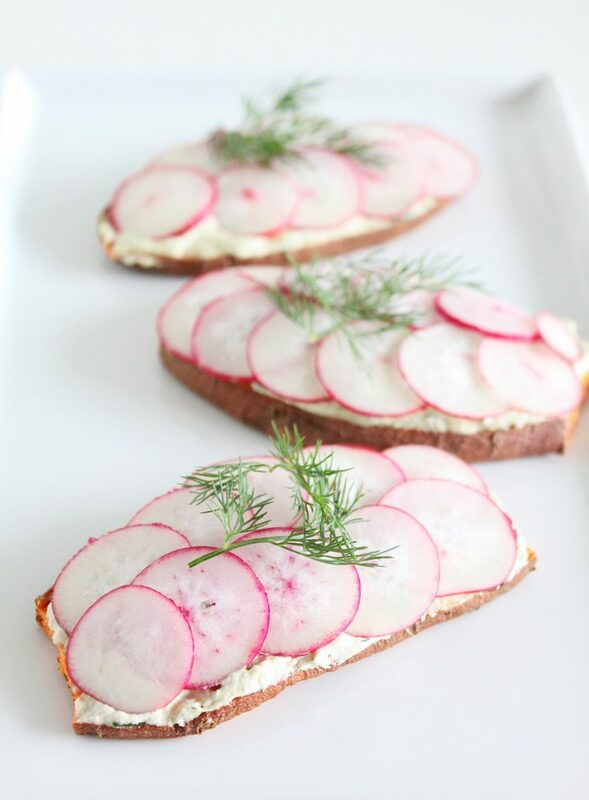 Today we have spread it on Sweet Potato Toast with sliced radishes and more fresh dill, but use it the way one might use cream cheese. Spread it on a sandwich, use it as a veggie dip, toss it with warm veggie noodles, stir it into some Millet Polenta, or something I did with the delicious leftovers: add it at the very end to some sautéed mushrooms. I even watered it down and tossed it with some diced cabbage, green onions and celery -a pretty great cole slaw. I like to think about that curly-haired lady in the cream cheese commercials (I think she was supposed to be an angel in heaven who had a thing for cream cheese?) anyway, she would stir that stuff into everything, and you should do the same. Let me know if you come up with anything delicious! 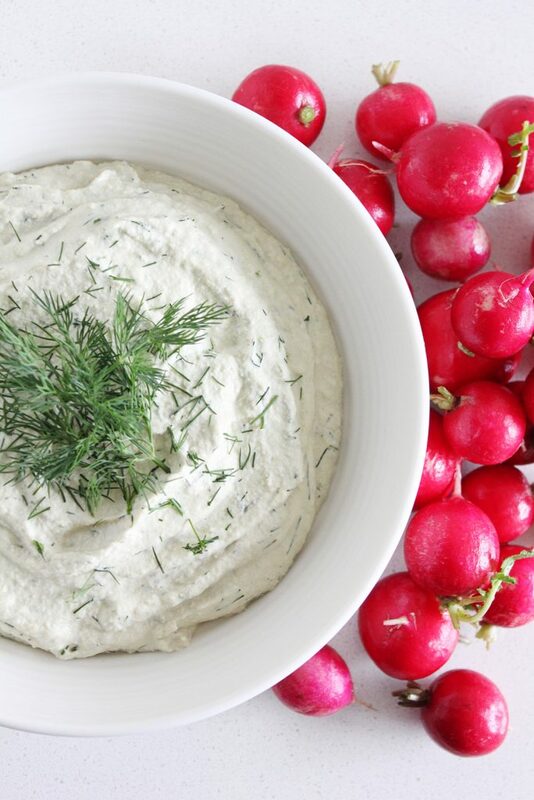 In a blender or food processor, blend all ingredients EXCEPT for the dill until very smooth. Once smooth, add the chopped dill and blend on low to combine (otherwise the whole thing turns green and you don't get the fun little pops of dill). 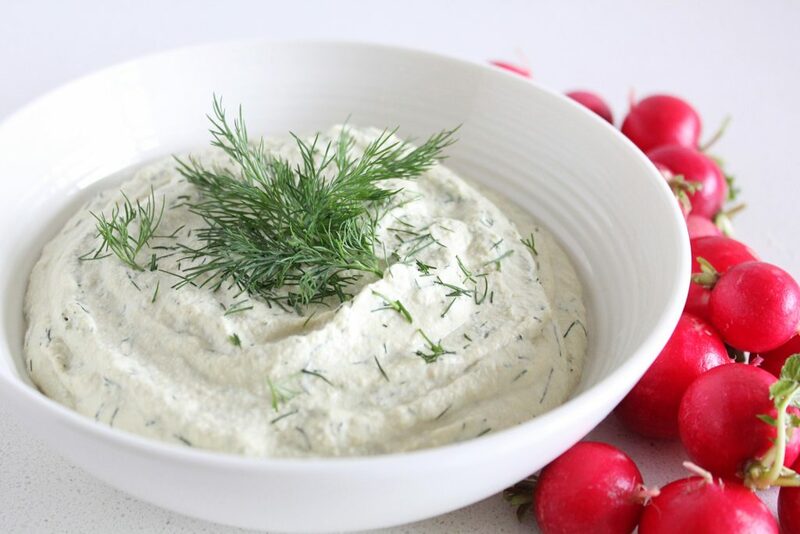 This dip is totally raw and rich in enzymes so if you plan to add it to cooked things like soup, pasta or roasted veggies, add it at the very end to retain the health benefits. Its still good for you once cooked, it just doesn't have the same health properties. It makes a lot, feel free to halve the recipe, just make sure that the smaller amount will still blend properly in your blender or food processor. keeps for 3-4 days in your fridge. Thank you for bringing this up! 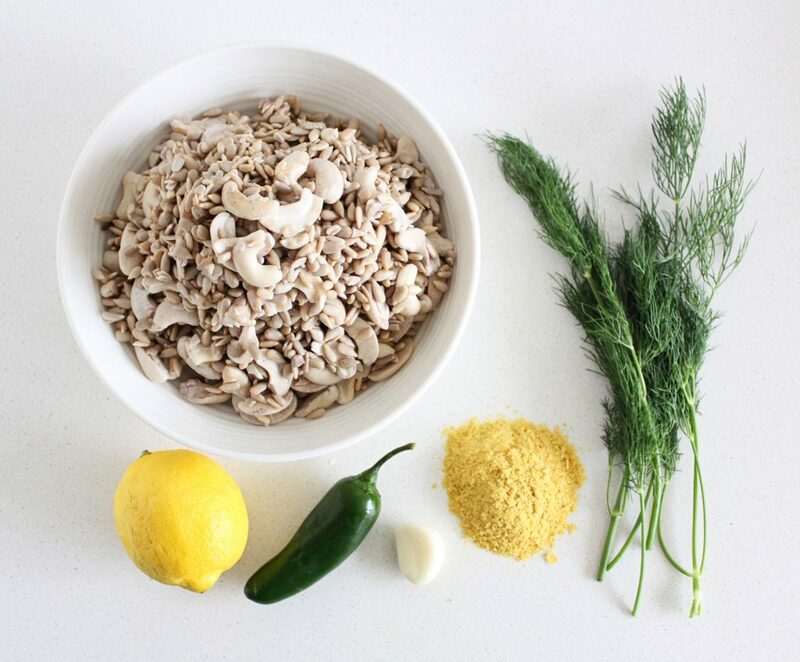 I have cooked for a couple of people who are sensitive to nutritional yeast (and I agree, it seems to have become a common ingredient in plantbased recipes). Although it gives this recipe a cheesy nudge, you can certainly just leave it out and it would still taste great. Another tip for avoiding NY is to sub in miso for it. Look for chickpea based, there are good quality soy-free miso pastes around if you’re avoiding soy. Add about 2/3 the amount of nutritional yeast in miso (so in this case, 2 Tbsp of miso) (or just add it to taste. )Keep in mind it is salty, so cut back on salt and taste as u go. This applies to most recipes using nutritional yeast. I hope this helps! Hi Dana, I hope you’re having fun with your new baby. I (and I think a lot of other people) have really bad symptoms after eating nutritional yeast. 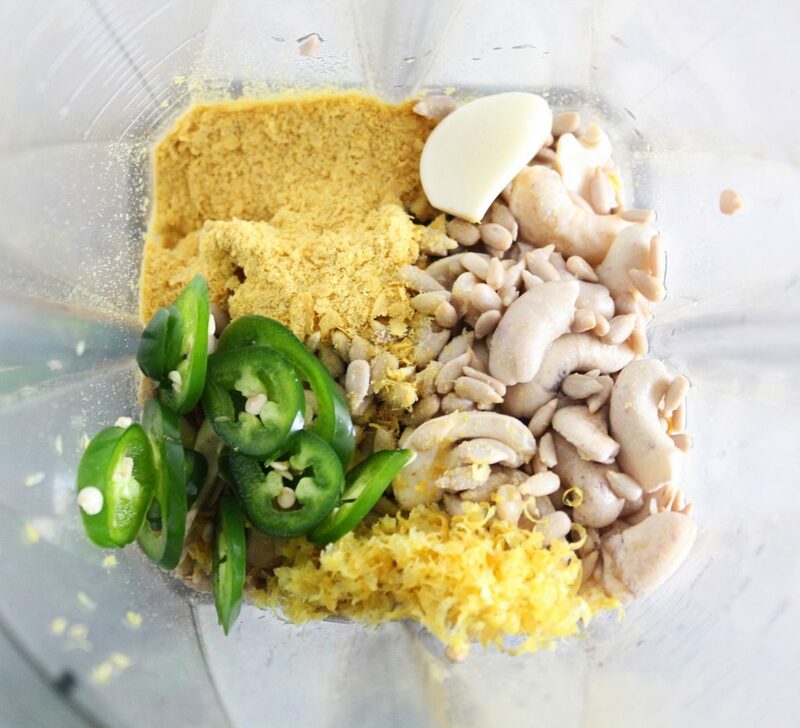 As a bomb of B vitamins, nutritional yeast is not as gentle an ingredient as it might seem for people with MTHFR variations, magnesium deficiency, or any other issue that is affected by an interruptions to the body’s fine balance of B vitamins. I just wanted to voice concern about the longstanding trend of relying on “nutch” to bring flavor to vegan recipes. I ate it for years before I made the connection to how bad it made me feel and there’s tons of new recipes out there these days that I can’t make because they depend on it.